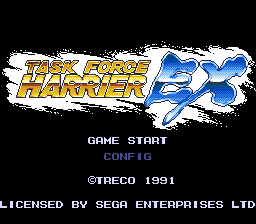 Task Force Harrier (タスクフォースハリアー) is a little-known 1989 arcade shoot-'em-up developed by NMK and published by UPL in Japan and American Sammy in the US. It was remade for the Sega Mega Drive in 1991 by Jorudan and published by Treco, again released exclusively in Japan and the US as the more well-known Task Force Harrier EX (タスクフォースハリアーＥＸ). This game is unusual for having exceptionally clear PCM audio for voices, and at least one song entirely in PCM. A communist group comes out of hiding and begin conquering the world, alerting the UN to call out Falcon, a noted fighter pilot, to stop them; however the communists have already readied their freedom-destroying superbomber, the TU-190, to launch towards the US, making Falcon's job more rash. Consequently he is given the Falcon V, an experimental airship, for this job. shoots and fires bombs at the ground, similar to Xevious. fires a screen filling smartbomb (you have a limited supply). Powerups can be collected the enhance the main shot, standard bombs and options around the ship. Options can be arranged around the ship in a variety of formations; use to cycle through them. Similar to the Force item in R-Type, these options absorb enemy bullets. Each formation also changes the ship's speed. Each stage has two sections. The first section takes place high above the ground with options available. The second section plays closer to the ground with options removed. EX has some secret options that allow you to skip stages, enable debug invincibility, and so on. A big one is the ability to add an information panel on the right side of the screen, much like the Toaplan ports. Hold and while booting the game and release them once the title screen animation stops, then press , , , , , , , , . There's no audiovisual indicator, but going into the Options menu displays the new options. Main article: Task Force Harrier EX/Magazine articles. Main article: Task Force Harrier EX/Promotional material.